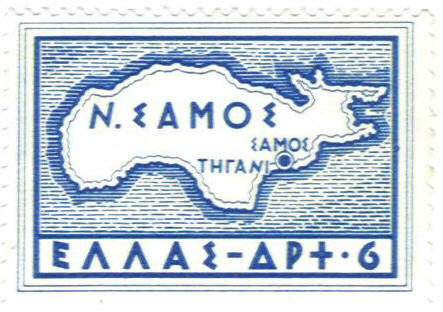 Pythagoras was born on the island of Samos where he spent his childhood. As a youth he traveled widely with his father and became broadly educated. 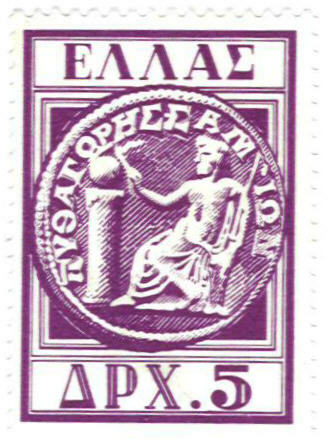 It was probably on one of these travels that he went to Miletus and met Thales. It was through Thales and his students that Pythagorus learned mathematics. The Pythagorean Theorem is usually considered the most important theorem in mathematics, but as a fact it was known earlier; as a list of special relationships it appears on Babylonian clay tablets. Pythagoras is known as the first pure mathematician; he was concerned with the principles of mathematics and gave the idea of a formal proof. He was the founder of a secret mathematical and religious cult; due to this secrecy, no distinctions can be made between the contributions of Pythagoras and the contributions of other members of the society. The cult was strictly vegetarian, but considered the eating of beans to be taboo. The discovery of incommensurability (irrationals) was devastating to the Pythagoreans and legend has it that they killed the member who disclosed the secret of incommensurability. Stamp No. 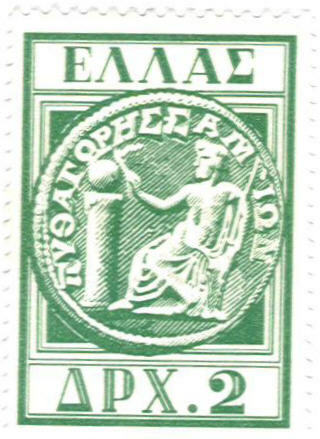 583 that depicts the Pythagorean Theorem for a 3-4-5 right triangle is one of my favorite stamps. 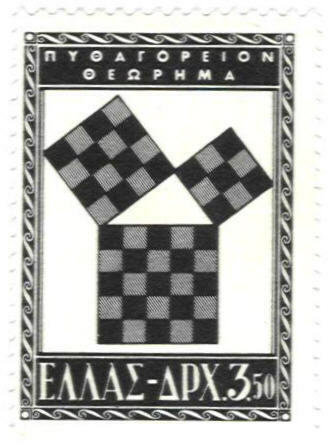 It is the logo of the Mathematical Study Unit and appears on the title page of each issue of Philamath. My wife has made me some embossed stationary with this figure on the cover. I, as was the case with every other mathematician, was very excited in 1993 when I received email notification that Andrew Wiles had announced a proof of Fermat's Last Theorem. I became even more excited when the one of the leads on the NBC nightly news the next day promised a story later in the program concerning the announcement. Tom Brokaw dampened my spirits when in a brief explanation of the theorem he alluded to the Pythagorean Theorem. He pronounced it PITH-a-GOR-ean! I had always heard it pronounced Py-THAG-o-REE-an. Later I came to wonder if maybe Brokaw was right; after all, he should be an expert on pronunciation. To check, I looked it up in Webster's New World Dictionary, third college edition of 1988. As you can see, I was right. My joy quickly disappeared, however. 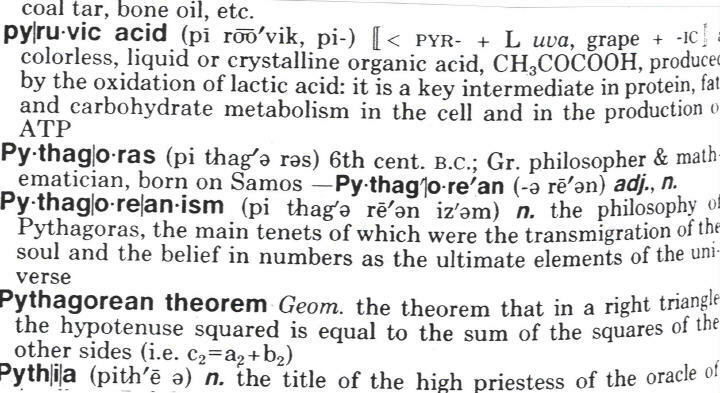 If you look closely, you can see that the dictionary's algebraic formulation of the theorem is incorrect. They have subscripts instead of exponents! The error does not occur in the next edition of the dictionary. No algebraic statement of the theorem is attempted!